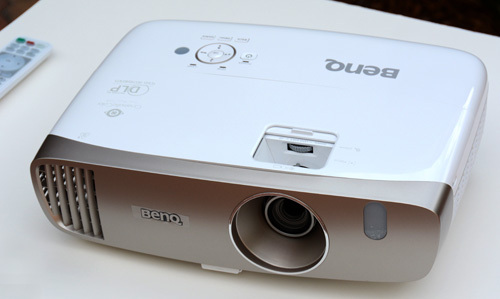 The BenQ HT3050 is one of three new full HD 1080p resolution home theater projectors being released by BenQ this fall. Priced at $999, it is the middle option, being a step up from the HT2050 at $799, and flanked on the high side by the HT4050 at $1,399. Since the HT3050 and HT2050 are the same basic projector with some noteworthy variances, this review will focus on the relative merits of these two models. We will address the HT4050, which is a different projector altogether, in a different review. 1. The HT3050 Cinema mode is more carefully calibrated to target Rec 709 standards while the HT2050's Cinema mode is not. 2. On the HT3050, one of the HDMI ports is MHL enabled. The HT2050 does not have this feature. The HT3050 also has the option to add a wireless module that uses a third HDMI port inside the case. This port is also MHL-enabled. The wireless module will be available for $399 beginning in January, 2016. 3. The 3050 has dual 10W speakers for much more robust onboard stereo audio; the 2050 has only one mono 10W speaker. 4. The 3050 has horizontal and vertical digital keystone adjustments, the 2050 has vertical keystone only. 5. The 3050 is a bit heavier at 8.1 lbs vs. 7.3 lbs for the 2050. 6. The 3050 has a brushed gold front bezel, and the 2050 is brushed silver. 7. The HT2050 is rated at 2200 lumens vs. the HT3050's 2000 lumens, a difference of no practical consequence. 8. We measure 49.7 ms input lag on the HT3050 and 33.1 ms on the HT2050. As you consider this list of differences, you may see reasons to spend the extra $200, or you may not. These are both solid and attractive projectors for the money, but they are designed to address the needs of different types of buyers. The big question of course is what differences there may be in image quality? When both projectors are put into the factory default settings in Cinema mode, the HT3050 produces a more refined picture with much closer to accurate color tones, simply because it has been more carefully calibrated at the factory. For most users, this will save the time and money involved with having it professionally calibrated. This is not to say that the HT2050 is bad. It puts out an attractive and engaging image on its own if you had nothing to compare it to. But if prospective buyers were shown these two units side by side (in their factory default calibrations) without being told anything about them, they would invariably choose the HT3050 as having the preferred image. We suspect most viewers would say that the incremental image quality is worth the additional $200. Having said that, it should be noted that IF you buy the HT2050 and spend the $300 to have that individual unit professionally calibrated, it is likely that the results will exceed that of the HT3050's factory Rec 709 calibration. That is because there is no such thing as a "one size fits all" factory calibration that perfectly optimizes every unit coming off the production line. (By the way, for the same reason, you should never assume that anyone's home grown calibrations posted on the Internet will optimize your particular unit.) The only way to get your projector tuned to perfection is by having it done by a pro calibration technician. If this is your intention, then you might want to go with the HT2050 instead. Since the HT3050 is the more substantial of the two models, we'll focus on the 3050 in the following comments. You can assume they apply also to the HT2050 except where noted. Many who buy this projector will be opting for Cinema mode. Though it is the least bright of the four, it puts out 1160 lumens in its brightest configuration which is more than ample for most dark room home theater needs. The factory programmed color balance is reasonably close to accurate Rec 709. It is certainly watchable out of the box without any need for calibration. However, after some viewing we became a bit frustrated with closed-off mid-tones, so several minor adjustments helped solve the problem: Brightness was increased from 50 to 51, Contrast was boosted from 50 to 53, and the default gamma setting of 2.2 was reduced to 2.1. On our test sample this produce a more open and satisfying gray scale. We also made some minor adjustments to color. However, a professional calibration of the HT3050's Cinema mode is not going to yield significant improvements in image quality. Results will vary from unit to unit, but in general the adjustments needed to dial in a balanced and satisfying picture were minor. For all but the most fastidious of videophiles, the HT3050's Cinema mode is quite satisfactory out of the box with little or no tweaking. Game mode is a bit brighter and slightly cooler in temperature than Cinema mode, but it is also perfectly serviceable for video/film. It activates the "Brilliant Color" feature, whereas the Cinema mode does not. Adding Brilliant Color to the image boosts brightness, and shifts color temperature toward a slightly cooler bias. White objects appear brighter than they should, but the effect is not nearly as heavy-handed as we've seen on other Brilliant Color implementations. The picture is overall quite pleasant. Some users will prefer Game mode over Cinema for most of their movie viewing, not just gaming. It isn't precisely accurate, but it is attractive. Vivid mode is incrementally brighter than Game mode. It exaggerates color saturation and contrast somewhat. Color balance is still within the general ballpark of reasonable, but saturation and contrast are boosted to the point where it looks, well, artificially Vivid. However, this can be a good thing. If you are one of those who likes to boost color saturation of your pictures in photo editing to make them look extra rich, you may enjoy the Vivid mode of the HT3050. At the recent CEDIA trade show, LG was demonstrating OLED TVs that pushed contrast and saturation to outrageous extremes, so that the picture is dazzling, eye-catching, mesmerizing, and utterly fake. Many folks like this effect. The Vivid mode on the BenQ projectors tends in this same direction but it is nowhere near as extreme. As far as Vivid calibrations go, this one is nicely done. Bright mode is the only one of the four that is radically off in color temperature, producing a picture that is tinted an obvious green. This makes grass look brilliantly green, blue skies look cyan, while anything red or magenta becomes dull and brownish. We cannot think of a good use for Bright mode. But it follows the long-established industry tradition of including a bright green operating mode to show that the projector is capable of getting within shouting distance of its lumen spec. In general, the HT3050 delivers solid black levels and high dynamic range, consistent with what we've come to expect from DLP. The picture is reasonably sharp with no excessive noise. Colors are (or can be) naturally saturated and well balanced due to high color brightness (see Performance section for details). The only flaw we noticed on both of our test units was related to brightness uniformity. The image on our particular test sample of the HT3050 fades noticeably to the right side, where brightness falls off as much as 30% from its levels in the rest of the picture. Essentially this produces a subtle vignetting effect on the right edge of the picture. This becomes noticeable in scenes that contain continuous tones that should be even across the screen (like skies and seascapes). On our HT2050, brightness uniformity is also less than great, but in a different way. The picture is brightest in the lower center and it fades most to the upper left instead of the right. On this unit the fading is incrementally progressive across the image, so it does not produce a vignetting effect, but the upper left corner is 40% less bright than the lower center. The substantial difference in uniformity patterns between our two samples suggests manufacturing variances in the alignment of the light engines. Three things must be said here. First, these are very early production test samples, and it is likely that once the production line is fine tuned, variances like this will be minimized and uniformity will improve. Second, what we see on these test samples may not coincide with what you would see on yours. Third, and perhaps more importantly, we are being more critical on issues like uniformity in this class of product than we have been in the past, because these are no longer cheap toy projectors. Technology has advanced to the point where products like the HT2050 and HT3050 and their competitors in this price niche represent excellent high-performance home theater projectors, so we evaluate them more critically than we did before. In point of fact, below average brightness uniformity is not something most users would notice while viewing video. It is most obvious when viewing a solid white test pattern. Flaws in uniformity usually get lost in the complexity of a video/film image. Unlike excessive digital noise, rainbow artifacts, or dull black levels, you can watch a whole movie without being aware of a problem. So as flaws go, it is far easier to live with than most. Ideal brightness for home theater. Rated at 2000 lumens, our test sample comes in around 1160 lumens in Cinema (Rec 709) mode. This is good for rooms that are not entirely blacked out, or for a very large screen installation. If you want to cut lumens, you can do that either by using the zoom lens or putting it into Eco mode. This flexibility lets you hit the sweetspot of brightness for most dark room home theater needs. 6x, RGBRGB color wheel. This color wheel configuration maximizes DLP performance potential for video by optimizing color brightness and virtually eliminating rainbow artifacts. Zoom lens and lens shift. Traditionally inexpensive DLP projectors have minimal zoom range and no lens shift. The HT3050 has a 1.3x manual zoom and some limited vertical lens shift as opposed to none. Terrific sound. The HT3050 has great audio. The dual 10W speakers produce the loudest and clearest we've ever heard on a projector of this size. Of course it still lacks the bass, dynamic range, and spatial surround features you'd like to have for movies, but this is the best on-board substitute for a surround sound system we've ever encountered on an inexpensive portable projector. The HT2050 eliminates one of the two 10 W speakers, so it does not have nearly the audio performance of the HT3050. However, if you have an external surround system, you won't want to use the audio on either of these models. Color Temp and Color Management. Both models provide the ability to fine tune color temperature with Red, Green, and Blue gain and offset controls. Both have the ability to adjust Hue, Saturation and Gain on RGBCMY. Connections. You get two standard HDMI ports, (one of which is MHL enabled on the 3050, but not on the 2050). You also get one VGA port, one 3-RCA component, one composite, one USB, one mini-USB, one RS-232, one audio in, and one audio out. The connection panel is on the rear of the unit, set between the speakers which are on the rear corners. An option on the HT3050 only is the addition of a wireless module for $399, which uses a third HTML/MHL port inside the casework. You also get a 12-volt trigger, which is a feature beginning to show up on more sub-$1000 home theater models these days. Projection options. For those new to projectors, virtually all projectors are made with the ability to project upright from a coffee table, inverted in a ceiling mount, or placed behind a screen for either table/shelf mounted or ceiling mounted rear projection. 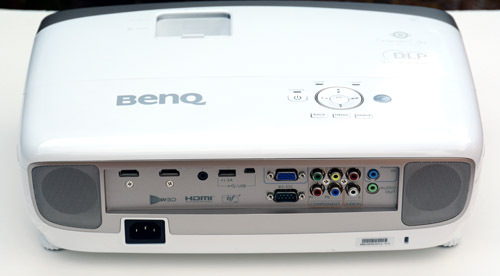 All BenQ projectors have these options as standard features. Full HD 3D. Both projectors are full HD 3D compatible, and automatically recognize a 3D source. The DLP-link glasses synch instantly. White casework and white remote. Many with white ceilings prefer a white projector because it does not stand out as obviously in the room. White remotes are easier to find in the dark. The remote is nicely backlit, tactile response is excellent, and the common sense layout makes it easy to use once you are familiar with it. H+V keystone. If you need to use keystone adjustments, you've got both horizontal and vertical on the HT3050 (vertical only on the 2050). This function is accessible only via a function button on the remote; it is not available in the on-screen menu. As always, on all native 1080p projectors we recommend avoiding the use of this feature if you can, simply because it adds scaling to the 1080p image, and it will reduce image brightness by turning off a portion of the chip. Anamorphic lens compatibility. 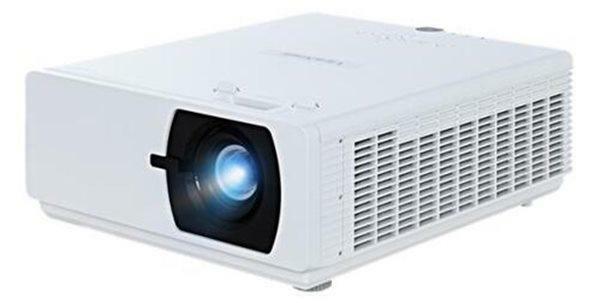 If you have an A-lens and want to use it with this projector, the vertical stretch required to accommodate it is an option in the aspect ratio selections. Security. Password protection is an option if you want to use it, and the projector comes with a Kensington lock. The HT3050 and HT2050 both have a 1.3x zoom lens that will curtail light output by up to 27% as you move from its brightest, most wide angle position, to its most telephoto (longest throw for a given image size). You can also reduce the projector's brightness 32% by putting it into Eco mode. Therefore, if the Cinema modes' 1160 or 1255 lumens are too bright for your dark room set up, you can cut it to about 800/850 lumens by switching to Eco mode, or you can reduce light output anywhere from 1% to 27% by moving the projector back and using a longer throw portion the zoom lens. Sharpness. These projectors are what we'd call reasonably sharp and competitive in their price class. They are never noticeably soft and, standing alone, they look perfectly well defined. We have seen marginally sharper projectors, but the difference would be visible only if they are displayed side by side. The Sharpness control has a rather subtle effect on image sharpness. We found the optimal setting to be 9 on a scale of 1 to 15. This is the point at which the image appears it sharpest without introducing unwanted artifacts. Color brightness is outstanding compared to many DLP projectors. In Bright and Vivid modes it measures 77% of white, in Game mode it measures 85% of white, and in Cinema it is the full 100% of white. Input lag. We get difference readings on the two models. On the HT3050 the Bodnar meter registers 49.7 ms lag in all operating modes, including Game mode. On the HT2050 it reads 33.1 ms. (Note: BenQ product management says that their Bodnar meter reports a lag of 47.6 ms on the HT3050). Fan noise. Audible noise in full power mode is relatively low in both pitch and sound pressure. These are two of the quieter HT projectors under $1000, but they are not as stone quiet as more expensive models can be. The vast majority of users will have no problem with it, but those who want a close to silent projector may want to opt for a more expensive unit. High Altitude Mode is required at elevations above 1500 m, or about 5000 feet. In this mode the fan noise is increased, but it is still quite livable and relatively unobtrusive compared to most units in this price class. This is a good option if you live in Denver, you don't want to spend more than $1000, and you want to keep fan noise to a minimum. Lamp life. BenQ estimates lamp life at full power to be 3500 hours. There are two eco modes -- Eco and Smart Eco -- that boost lamp life up to an estimated 5000 hours and 6000 hours respectively. Replacement lamps cost $249. The HT3050 and HT2050 will thrown a 120" diagonal 16:9 image from a distance of between 10 and 13 feet. With this size screen, if you choose to place it at 10 feet, image brightness is maximized, if you put it at 11.5 feet, brightness is reduced by 14%, and if you set it back to 13 feet, image brightness is reduced by 27%. So choose your throw distance carefully while keeping your desired image brightness in mind. Use the Projection Calculator to determine your actual throw distance options based your desired screen size. These projectors are designed to be used most efficiently either table mounted or inverted and ceiling mounted. As is typical with this design, placing the projector on a rear shelf and projecting over the heads of the audience will be problematic. You would probably need to tilt the projector downward to position the image properly. This will require keystone adjustment, and it may require more than the maximum allowable tilt, which is 15 degrees. Also keep in mind that the manual stipulates a clearance of 20 inches between the rear of the projector and the wall. Furthermore, if the projector is very much behind you, it is likely that the screen size at that throw distance will be too large for your viewing distance (unless you are among those who prefer front rows in a movie theater). If you prefer to sit at a distance of about 1.3x the screen width, which is a common preference, the ceiling mounted projector will be pretty much directly over your head. This is the best way to install the unit for optimal screen illumination, as it will project slightly downward to the screen, and the screen will reflect back downward again to the position of the viewers (angle of incidence = angle of reflection). The projector has a built in upward throw angle that puts the bottom edge of the image slightly higher than the centerline of the lens (or lower than the centerline of the lens if inverted and ceiling mounted). The offset is approximately 10% of the image height. From that point you can elevate the image up to another 10% of the image height using the Lens Shift control. Input lag. The 49.7 ms input lag on the HT3050 may be enough to make serious gamers think twice since many DLP projectors (including the HT2050) have a lag of 33 ms, and occasionally we find one that is faster. 49.7 ms is also enough of a delay that it will create minor lip synch issues, so an audio delay would be nice. A little bit o' lens shift. This is both an advantage and a limitation. It is an advantage because most projectors in this price category don't offer lens shift at all. So to that extent it is a genuine benefit. The only reason it is a limitation is because higher priced models offer much more extensive lens shift range than just 10% of the picture height. But the fact that the HT3050 has it at all is progress, so we must keep that in perspective. Brightness uniformity. As noted in the Picture Quality section, the 3050 and 2050 test units we have are both below average on this metric but in different ways. If you must settle for at least one flaw in a projector, this is the one you'd want. Slow synch on new signals. These projectors take their own sweet time figuring out new signals. Once they lock onto a steady signal they are fine, but when you fire up a Blu-ray disc, they are initially confused by the changing formats in the start up sequences. You may or may not see the FBI alert screen, as during the time the player is outputting that image the projector is fumbling around trying to determine what the signal format is. When the Blu-ray player starts outputting, say, the Universal Studios logo splash screen, you might see only the last few seconds of it on the HT3050, as it can take that long for it to identify and lock onto the new video signal--you hear the audio long before you see the picture. In general, you see a lot of "searching for signal" messages and intermittent snow screens during the start up phase for any new source or when switching movie discs. This is more pronounced on the HT3050 than on the HT2050, which is a bit faster in figuring it out. Once they lock onto the movie signal it is fine, but this is a messy way to start a film presentation. One-year warranty. Several vendors in this market niche offer two or three year warranties, but some offer just the conventional minimum one-year. BenQ is one of them. Any indication that BenQ will release a new ST model based on these newer PJs? Can you comment on how the brightness uniformity of the BenQ W1070 compares to the BenQ HT2050 ? Ummm, black levels? Or is that not something you guys look at any more? Evan, thanks for the review. I note you said in the Projector News and Industry Commentary Post "we will move to a shootout of the BenQ models...the Epson Home Cinema 2040, and the Optoma HD28DSE". Obviously this is certainly very important. However, is it also possible to gain some critical commentary on how the HT2050 & HT3050 specifically perform relative to the W1070 After the popularity of the W1070 over the last few years its now useful for many to compare the new against the W1070 landmark projector and measure whether an upgrade is now justifiable? I have a Benq projector from the previous generation (W1500) so based on my 1.5 years of using it I'd highly recommend either of these two newer projectors. Thanks for the review, but the burning question: How does the HT3050 compare to the HT1075? Similar sharpness & uniformity with slightly improved color but a reduction in "best mode" light output? Any increase in contrast? Yes. Just as I was about to finalize HT1075, I came across the two new ones, HT2050 & HT3050. So, can a comparison be made between the old one the 2 new ones? At this time there are no plans to release an ST model based on this platform. That is not to say it will not happen, just no plans for it at this time. "The HT3050 has a 1.3x manual zoom and some limited vertical lens shift as opposed to none." Evan, Doesn't the HT2050 also have 1.3 manual zoom and vertical lens shift? The statement in the article is slightly confusing making it sound like only the HT3050 does. Can you confirm that the 2050 also has it? Fan noise between the HT2050 and Epson 2040, in ECO which is quieter and lower pitch? In their brightest (nosiest) mode of the two which is quieter? Thank you for all the great reviews! Love the site! J M ... yes the 3050 and 2050 both have the same zoom and vertical lens shift. With respect to fan noise, the 2050 is relatively quiet in both full lamp and eco mode, but the fan noise is the same in either mode. Fan noise does not drop when you put it into eco mode, as it does on many projectors. The Epson 2040, when in eco mode, is virtually identical in fan noise to the 2050 in both pitch and volume. The Epson 2040 is louder in normal, or full lamp power, but quite a bit brighter as well, especially in 3D. Also - can you clarify if the 2050 and 3050 Benq and if the Epson 2040 / 2045 can use Samsung 3D glasses number SSG-5150GB 3D active glasses and SSG5100 and SSG4100GB?? Obviously buying glasses again increases price a lot and we all should be aware.. Thank you. I have the ht1085st been using it for just about a year now and I am still amazed of how clear the picture quality is looks just as good as my Samsung smart tv just a lot bigger. Fan noise is no big thing for me I've never even heard the Damn things. And the speakers I would prefer they remove them and make them a tad cheaper or just add some better options or extra bulb instead or something. But over all in love with it I can just imagine how.nice these newer ones are. You can use Samsung RF glasses with Epson 2040 series of projectors, as about the Benq I'm not sure. I just upgraded my W1070 to HT3050 and I am happy.For those wondering if it is worth the extra 200 dollars yes it is and more to like such as the onboard speakers. Mine is hooked up to a bose surround but with the on board speakers it is a lot more.Then the picture, cinematic colors are terrific and sharpness and brightness is absolutely a step up from the w1070. This is also quieter.I still have to try the 3D. Does 3D work in keystone on the 2050? I purchased a $500 projector for a 96 inch wide screen and the picture was not as crisp as I wanted so I bought the HT 2050. The picture clarity is exceptional and it has many more connection options than the cheaper projector I bought and returned. Am very pleased I made the upgrade. .i was wondering if anyone can explain why the Benq ht2050 loses its video settings once it's turned off. Mine will go from my preset cinema mode to vivid, even resetting the lamp from Eco to normal.